We ask you, brothers and sisters, with regard to the coming of our Lord Jesus Christ and our assembling with him, not to be shaken out of your minds suddenly, or to be alarmed either by a "spirit," or by an oral statement, or by a letter allegedly from us to the effect that the day of the Lord is at hand. Today's Liturgy is focused on the characteristics of God. All the readings that we have heard reveal to us who God is. In the First Reading from the Book of Wisdom, it is revealed that our God is a God of mercy. He is a God of compassion. He is a God of forgiveness. The Responsorial Psalm describes furthermore God's mercy, compassion and forgiveness. He is a God who is rich and great in mercy and kindness. He is a God of opportunity. He gives us a chance to repent, to be good and improve. And in today's Gospel, we have seen the personification of that God in the person of Jesus. He is a God who seeks those who are going astray. He is full of mercy and runs after sinners. This is totally opposite from our tendency. Whenever we are offended or hurt, yes, we can forgive, but we expect the other person to make the first move. That is our kind of reasoning, so we wait. But our God is a God who initiates. He is ready to bow down, just to meet the sinners. Yes, God is powerful, but His power is manifested in His mercy, in His compassion, in His gentleness. This is totally opposite with the power that we know in this world. In our society, people of power are stiff and feared. We tremble in front of them. We should not disobey them, or we face the consequences. But our God who is powerful is full of gentleness and love. When Jesus met Zacchaeus, Jesus ran after him, inspired him, and brought him to repentance and conversion. Zacchaeus was a public sinner and I am sure that he was aware of his stature. He was considered a powerful man during that time, but he was aware of his sins. Perhaps he already heard criticisms and have experienced rejections from the people around him. But when Jesus met Zacchaeus, he did not say anything bad about him. Jesus just told Zacchaeus that He needed to stay in his house today. Hindi Niya sinumbatan si Zacchaeus. And Zacchaeus was deeply touched by that power. It was like a magnet that he could not refuse. My dear friends, that's the power of God, manifested in His mercy, in His compassion, in His forgiveness. May we be inspired by that mercy, by that power of God. As has been said in one of our readings, may we be consumed also 'like the morning dew in front of the sun'. That was Zacchaeus. He was absorbed by the compassion of Jesus. He was ready to abandon everything, when he told the Lord that he shall give half of his belongings to the poor and pay those who he took advantage of. My dear friends, when we truly experience God's compassion and mercy, we cannot but share the same mercy, the same compassion, the same forgiveness to others. And so, if we find it hard to forgive, to understand and to feel sympathy toward our brothers and sisters, let us remember the mercy and compassion that God has freely and generously given to us. Let us pray that we may be like our Lord God and become instruments of God's mercy. 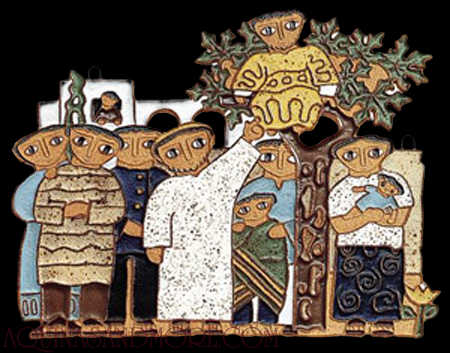 Just like Zacchaeus, may we join the company of Jesus, proclaiming the same mercy, the same compassion to other people. May we truly be God's compassion, and may we manifest it to others. In the name of the Father, and of the Son, and of the Holy Spirit, Amen.